Saudi Arabia is an autocracy. An autocracy means that the citizen can do nothing to influence the government, so pretty much citizens have no power what so ever. But they have assemblies called “majlis” so the citizen can ask a favor to the king and it is within the king’s power to grant it or deny it. Saudi Arabia has a unitary system of Power Distribution, like Iran and Israel. A Unitary system places all of the power of the government into one central authority, which means they make all of the decisions on both a national and regional level. In Saudi Arabia, the king has full control over everything, whereas the regional authorities have no say in what happens. This system is stable and easy to use for Saudi Arabia. Saudi Arabia is a Monarchy. Since Saudi Arabia is a monarchy, they have a king as there leader. The consultative council advises him. 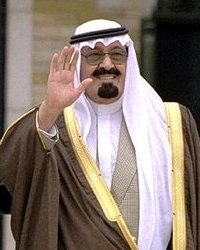 The current monarch of Saudi Arabia is Abdullah bin Abdul Aziz. The leader inherits his power. He has complete power and makes all of the final decisions. He even chooses who is in the consultative council. Saudi Arabia is ruled by a monarch. Since the monarch has all of the power, this doesn’t leave much freedom for the citizen. Citizens in an autocratic system usually do not have a lot of rights. Freedom of speech is suppressed, which means they citizens can NOT protest. A protest in this country can lead to violence. Freedom of Media is also suppressed, as the news is not allowed to express views going against the king. As a matter of fact, the media is often influenced by national authorities to say good things about the king. Citizens also are not allowed freedom of religion. They cannot choose their religion and must abide by strict social/religious rules set by the monarch. Saudi Arabia is an autocratic, unitary monarchy. Power is distributed on one national level. One person, the leader, has control over the country. The leader is a Monarch. The citizens have little to no power and they are restricted by strict social/religious rules.